The Business Budget Sheet is the perfect tool for any business or organization to get a comprehensive overview of their cash flow. This Budget Sheet has everything you need to keep track of the various salaries, taxes, insurance policies, and any other expense associated with your business and conveniently calculates your budget and the actual cost and gives you the precise amount you’re over or under budget. 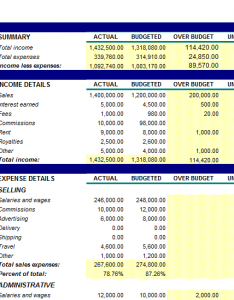 Organize every aspect of your business with the simple and free Budget Sheet. After you have successfully downloaded the free template from the link at the bottom of this page you can begin customizing the information to fit your business. The “Income Details” section in the first tab is where you will enter the overall budget and actual expenses for your monthly finances. Start by entering your income information. The template gives you a space for your: sales, interest, fees, commissions, and rent to which you can enter your various modes of income. After this, you will go to the “Expense Details” section and enter all of your subsequent expense information. To get you started the template includes a list of helpful examples of common expenses for businesses. At any time you can change or add new expenses or methods of income that are common for you. Simply click the cell you want to change or add something and just start typing in your own information. The template will take all of the data you entered and apply them to the five other tabs containing various graphs: summaries, administrative expenses, service expenses, income details, and selling expenses. These graphs break down the main aspects of your organization and illustrate their inherent value in the simplest way possible. The graphs give you the opportunity to adjust any aspect of your business, after viewing the data correlating with your major expenses from that part of your business.